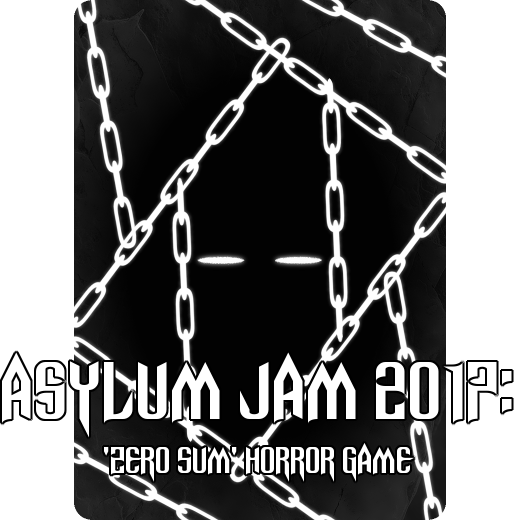 Project: Asylum Jam 2017 Game! The Pitch: It’s a drafting game where you’re all trapped in nightmares rent by guilt, and only one of you can escape into wakefulness. Or maybe you’r assembling a demonic rune so you can consume the souls of the other players. Or maybe you’re making deals in a demonic market. Or maybe you’re escaping a slasher movie villain. The game is played in an open rochester draft from a grid of 3×3 cards. Players each on their turn get to draw a card from each stack. By default these cards have a face that represents some sort of virtue or ability you have for yourself. 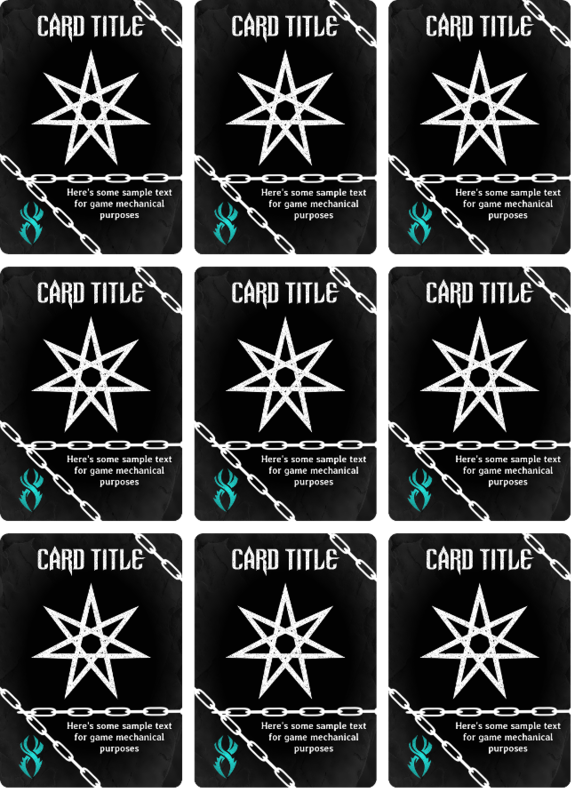 The cards have a visual element on them to make them easily sorted from one another, and each card has room for a basic symbol that sets them apart from their others, allowing them to collect into sets or protect one another. 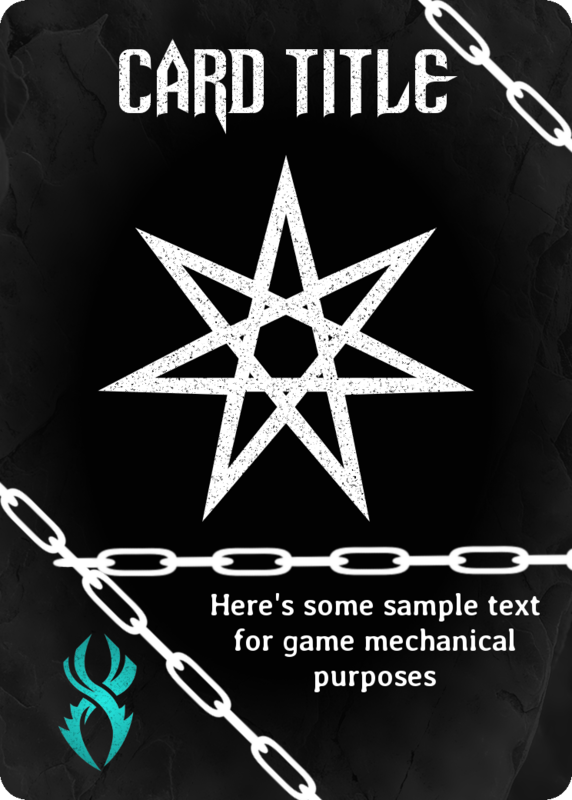 These cards are cards that make up the bulk of what you want to do, and they are also your personal resolution and protection as the trauma of the night shakes each player. 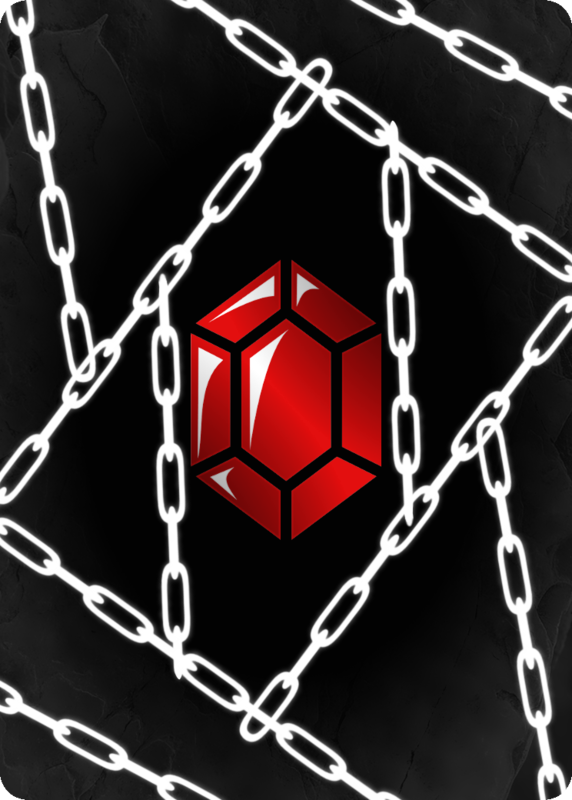 At the start of the game these stacks are seeded so that each stack features a single marked red gem card. These gem cards represent the game ending: Each time such a card is revealed, you take it off the stack immediately, and secretly flip it over, shuffle it into one of the other stacks, and then reveal the card beneath it. Face-up ruby cards (and let’s face it this asset will change) when revealed by taking a new card inflict a penalty on the player who takes them, and when a certain number of these cards are revealed, doom has grown too great, and the players are suffocated in the darkness. Only one player has a chance to escape this – and it depends on what they’ve drafted up to that point. So play is about building a defensive bulwark, a way to protect yourself, and trying to lay landmines for your opponents. Well if this idea only goes up until the end of Sunday Night (the 48th hour of the time I assigned to work on this), we’ll have to see how close we get to it. I’m still not sold on the theme either: I want this game to be a one-deck wonder and I don’t want to play with horror themes, but if it’s about escaping/surviving a slasher movie monster, isn’t that preying on fears of mental health as well? Is any horror trope borne out of mental health concerns when they come from someone who’s the survivor of mental and emotional abuse? Can I write a horror that is not tainted by the horror in my own mind? There’s also some choices for aesthetics. We’ll have to see. Anyway, if you want to play this game, or have ideas for aesthetics or ways to add to this game, let me know! Feel free to contact me, either via the Twitter DMs or by emailing me!